Jan Pryor, Yvonne Lamont and daughter Summer Lamont slept on the ground for four nights: Home for four nights. 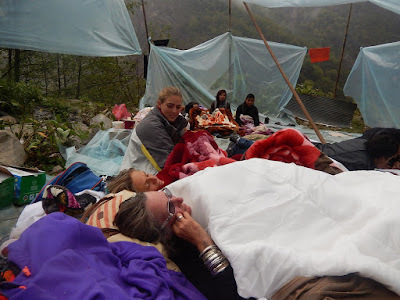 On April 25, 2015 two Didi Nepal volunteers Yvonne Lamont, founder of WOW Girls (Waves of Wisdom), her daughter Summer Lamont and myself commenced an eight day road tour from Kathmandu to Tibet. On this glorious day and ten minutes after crossing the border into Tibet, our life changed from a sense of adventure to that of fear, isolation and imminent danger in the Nepal earthquake. Out of the blue, a landslide hit our tour vehicle. Bewildered and shocked, we became surrounded by plummeting rocks as the hill was violently shaking and there was an incredibly loud foreign noise that added to our heightened sensory overload. Cars and trucks were bouncing on the road and we witnessed our first landslide which was tumultuously pelting down the opposite valley. Sadly this landslide demolished the quaint little town of Kodari where we had a cup of tea half an hour earlier. For hours we waited anxiously through violent tremors, landslides and the road cracking around us. Fear generated us to be instant strategic planners of survival tactics, but in amongst all of this fear came an incessant Aussie sense of humour. Laughing became our saving grace over the next five days. The first frightening night was spent at the Chinese army base where the next morning we were given five minutes to pack our small bag of essentials and trek through the completely annihilated town of lower Zhangmu. We spent the next four nights in an unstable and dangerous Chinese evacuation camp. We slept on the ground under a plastic make shift tent, lined up for rice, had no drinking water and stayed in the same clothes and boots for five days. Sanitation was a very big issue until someone built a toilet. Our world became full of anxiousness as we graciously accepted that fact that we were going to die - we just did not want it to hurt. After being listed as missing by our families for five days, we were gratefully evacuated to Llhasa on April 30. The Didi Foundation runs various programs to ensure that disadvantaged women, especially those from the lower cast, have opportunities to be educated and learn life skills. We currently run a sewing school, computer training and a women’s co-operative to manufacture various products to sell. In conjunction with the Nepalese Government, we are also running a traditional weaving course and an education course to prepare women to apply for government positions. We have also joined with the Nepalese Health Department to run workshops and health clinics specialising in women’s reproductive education. Didi Foundation carried out immediate relief aid to devastated villages, including teams of medical personal, food, tents and then iron. I returned to Nepal on June 23 to commence the rebuild Nepal program and finish the women’s centre in Kathmandu. Through the support of the Rotary Club of Woy Woy, NSW we are delivering much needed medical equipment to regional hospitals and assisting in supplying materials for the building of temporary schools. The Didi Foundation Inc. believes ‘one person can make a difference’ and we are “creating a future and changing a destiny.’ The Didi Foundation is currently fundraising to support Nepal in its rebuilding phase. Tax deductible donations can be made via https://donations.rawcs.com.au/Default.aspx?ProjectID=682&ReturnTo=4. Find us on Facebook https://www.facebook.com/didifoundation. Jan Pryor is available as a guest speaker. All inquiries to janpryor08@gmail.com.